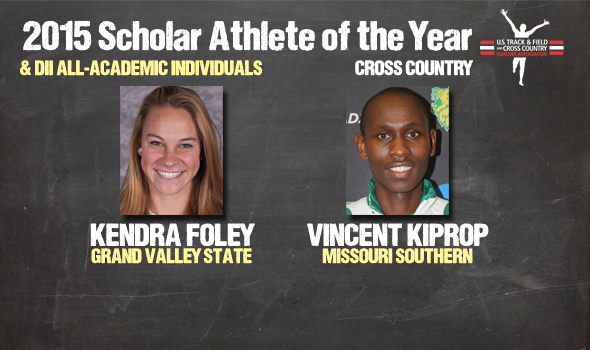 NEW ORLEANS – Kendra Foley of Grand Valley State and Vincent Kiprop of Missouri Southern have been named the USTFCCCA NCAA Division II Scholar Athletes of the Year for the 2015 cross country season, headlining the individual academic awards announced Friday. The two were named the Female and Male Scholar Athletes of the Year, respectively, as the top-finishing runners at the NCAA DII Championships who earned USTFCCCA All-Academic honors. Foley came out on top of a class of 384 All-Academic women, while Kiprop emerged from a field of 266 men’s honorees. Full lists of the All-Academic honorees can be found below. Foley, last season’s NCAA Champion who narrowly finished runner-up in Joplin, Missouri, this time around, is a junior communication and sport leadership major with a 3.445 cumulative grade point average. The native of Noblesville, Indiana, finished no lower than sixth-place in the three meets she contested this season. She was edged out for the NCAA title by .3 of a second, finished sixth in the Midwest Regional, and made her 2015 debut with a third-place effort in the GLIAC Championships. Kiprop is a freshman nursing major with a 3.33 cumulative grade point average. In his first season on the NCAA cross country circuit, Kiprop claimed runner-up honors at the NCAA Championships. Outside of an 11th-place finish against a mostly-Division I field at the Arkansas Chile Pepper Festival, the native of Kericho, Kenya, finished no lower than runner-up throughout the season. He notched wins at the Central Regional, the MIAA Championships and the MSSU Southern Stampede. Foley and Kiprop were among the 384 All-Academic women and 266 All-Academic men from the 2015 NCAA Division II Cross Country season. The 384 women came from 137 different programs. Three squads put their entire varsity line-ups on the All-Academic list; East Stroudsburg, Montevallo and Seattle Pacific all had seven honorees. Eleven more women’s teams posted six All-Academic honorees. An incredible 53 women finished the fall with perfect 4.0 grade point averages. The 266 men hail from 115 different teams around the nation. Bentley stood alone above the crowd with six All-Academic honorees. Eight more teams added the equivalent of a scoring line-up to the All-Academic list with five apiece. Fifteen different men finished with 4.0 grade point averages. The full All-Academic individual lists for men and women are below.